PH0004983/170 - FIRST DEVON & CORNWALL LTD, THE RIDE, CHELSON MEADOW, PLYMOUTH, PL9 7JT Variation Accepted by SN: Operating between PENZANCE Bus Station and LANDS END given service number 1/1A effective from 24-May-2015. To amend Timetable. 1/1A/1B/1C (Lands End - Penzance) Will operate as per the Summer 2014 timetable with minor amendments. PH0004983/171 - FIRST DEVON & CORNWALL LTD, THE RIDE, CHELSON MEADOW, PLYMOUTH, PL9 7JT Variation Accepted by SN: Operating between Penzance Bus Station and Falmouth, The Moor given service number 2 effective from 24-May-2015. To amend Timetable. 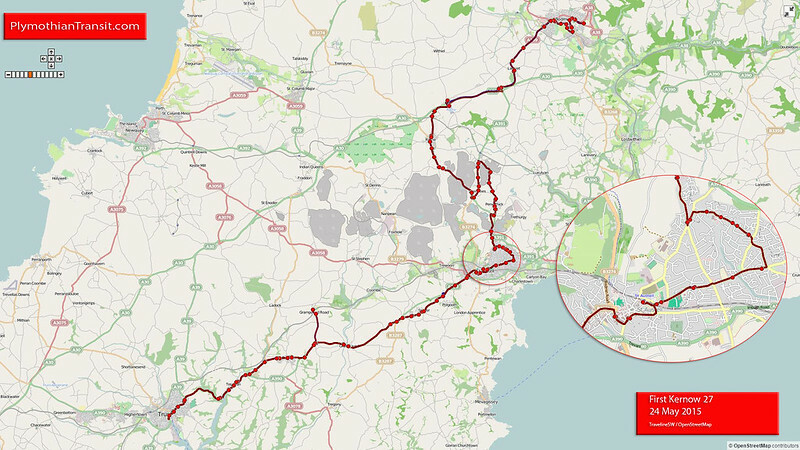 Some changes to the 'short' journeys between Helston and Penzance. PH0004983/172 - FIRST DEVON & CORNWALL LTD, THE RIDE, CHELSON MEADOW, PLYMOUTH, PL9 7JT Variation Accepted by SN: Operating between PENZANCE Bus Station and MOUSEHOLE given service number 6/6A effective from 24-May-2015. To amend Timetable. PH0000135/166 - PLYMOUTH CITYBUS LTD, MILEHOUSE, MILEHOUSE ROAD, PLYMOUTH, PL3 4AA Variation Accepted by SN: Operating between Plymouth, Royal Parade and Liskeard, Ballas Street given service number 11 effective from 31-May-2015. To amend Route and Timetable. PH0004983/492 - FIRST DEVON & CORNWALL LTD, THE RIDE, CHELSON MEADOW, PLYMOUTH, PL9 7JT Variation Accepted by SN: Operating between Penzance Sainsbury and Penzance Sainsbury given service number 11 effective from 24-May-2015. To amend Timetable. Minor timetable alterations improve punctuality and reliability. PH0004983/438 - FIRST DEVON & CORNWALL LTD, THE RIDE, CHELSON MEADOW, PLYMOUTH, PL9 7JT Variation Accepted by SN: Operating between Penzance and St Ives given service number 16/16A effective from 24-May-2015. To amend Timetable. PH0004983/173 - FIRST DEVON & CORNWALL LTD, THE RIDE, CHELSON MEADOW, PLYMOUTH, PL9 7JT Variation Accepted by SN: Operating between PENZANCE Bus Station/ ST IVES and MADRON/ ST IVES/ ST JUST given service number 17/10/10A/17A/17B effective from 24-May-2015. To amend Route and Timetable. PH0004983/500 - FIRST DEVON & CORNWALL LTD, THE RIDE, CHELSON MEADOW, PLYMOUTH, PL9 7JT Variation Accepted by SN: Operating between Newquay Bus Station and St. Austell Bus Station given service number 21 effective from 24-May-2015. To amend Timetable. PH0004983/517 - FIRST DEVON & CORNWALL LTD, THE RIDE, CHELSON MEADOW, PLYMOUTH, PL9 7JT Variation Accepted by SN: Operating between Truro Bus Station and St Austell Bus Station given service number 22 effective from 24-May-2015. To amend Route and Timetable. 522 (St Austell - Truro) Service to be re-numbered as service 22. There are some minor changes to the timetable. PH0004983/511 - FIRST DEVON & CORNWALL LTD, THE RIDE, CHELSON MEADOW, PLYMOUTH, PL9 7JT Variation Accepted by SN: Operating between St Austell and Newquay given service number 23 effective from 24-May-2015. To amend Timetable. 527 (Newquay - St Austell) Service to be re-numbered as service 23. There are no changes to the actual timetable or route. PH0004983/514 - FIRST DEVON & CORNWALL LTD, THE RIDE, CHELSON MEADOW, PLYMOUTH, PL9 7JT Variation Accepted by SN: Operating between Polmear Parc and St Austell Bus Station given service number 25 effective from 24-May-2015. To amend Timetable. 525 (Polmear - St Austell) Service to be re-numbered as service 25. There are no changes to the actual timetable or route. PH0004983/505 - FIRST DEVON & CORNWALL LTD, THE RIDE, CHELSON MEADOW, PLYMOUTH, PL9 7JT Variation Accepted by SN: Operating between Bodmin Morrisons and St Austell Bus Station given service number 27 effective from 24-May-2015. To amend Route and Timetable. 27 (Bodmin - Truro via St Austell) All service 27 buses will now serve Boscoppa. There will also be revised running times between Bodmin Morrisons and St Austell Bus Station. There is no change to the timings of journeys between St Austell Bus Station and Truro Bus Station in both directions except that the existing 1645hrs ex St Austell Bus Station journey on Monday to Saturday departs at 1650hrs and operates five minutes later throughout. 30 (St Austell Local Service) A revised timetable will operate. PH0004983/440 - FIRST DEVON & CORNWALL LTD, THE RIDE, CHELSON MEADOW, PLYMOUTH, PL9 7JT Variation Accepted by SN: Operating between Helston and Falmouth given service number 35/35A effective from 24-May-2015. To amend Timetable. PH0004983/376 - FIRST DEVON & CORNWALL LTD, THE RIDE, CHELSON MEADOW, PLYMOUTH, PL9 7JT Variation Accepted by SN: Operating between Helston and Redruth given service number 37 effective from 30-May-2015. To amend Timetable. PH0004983/447 - FIRST DEVON & CORNWALL LTD, THE RIDE, CHELSON MEADOW, PLYMOUTH, PL9 7JT Variation Accepted by SN: Operating between Helston and The Lizard given service number 37 effective from 30-May-2015. To amend Timetable. PH0004983/373 - FIRST DEVON & CORNWALL LTD, THE RIDE, CHELSON MEADOW, PLYMOUTH, PL9 7JT Variation Accepted by SN: Operating between Camborne Bus Station and Helston given service number 39/938 effective from 24-May-2015. To amend Timetable. PH0004983/464 - FIRST DEVON & CORNWALL LTD, THE RIDE, CHELSON MEADOW, PLYMOUTH, PL9 7JT Variation Accepted by SN: Operating between Penzance Bus Station and Camborne Bus Station given service number 39A effective from 24-May-2015. To amend Route and Timetable. PH1086607/15 - NICHOLAS COLIN EASTWOOD T/A Royal Buses, VICTORY HEIGHTS, THE BURROWS, ST. IVES, TR26 1GD variation Accepted: Operating between St Ives Royal Square and Trevalgan given service number Trevalgan 44 effective from 23-May-2015. To amend Timetable. PH0004983/446 - FIRST DEVON & CORNWALL LTD, THE RIDE, CHELSON MEADOW, PLYMOUTH, PL9 7JT Variation Accepted by SN: Operating between Helston, Tesco and Pool, Tesco Extra given service number 45/945 effective from 24-May-2015. To amend Timetable. PH0004983/516 - FIRST DEVON & CORNWALL LTD, THE RIDE, CHELSON MEADOW, PLYMOUTH, PL9 7JT Variation Accepted by SN: Operating between Truro Bus Station and St Mawes Car Park given service number 50/51effective from 24-May-2015. To amend Timetable. 550 (St Mawes - Truro) Service to be re-numbered as service 50. 551 (Truro - Veryan) Service to be re-numbered as service 51. Certain journeys will now serve Besseyneath Treworran Garage and Veryan Green (and are not routed via Portloe). PH1086607/14 - NICHOLAS COLIN EASTWOOD T/A Royal Buses, VICTORY HEIGHTS, THE BURROWS, ST. IVES, TR26 1GD Variation Accepted: Operating between St Ives, Royal Square and Polamnter given service number 55 effective from 23-May-2015. To amend Timetable. PH0004983/518 - FIRST DEVON & CORNWALL LTD, THE RIDE, CHELSON MEADOW, PLYMOUTH, PL9 7JT Variation Accepted by SN: Operating between Newquay Bus Station and Padstow Bus Terminus given service number 56 effective from 24-May-2015. To amend Timetable. Sunday and Public Holidays Hourly during the day time throughout low and high summer. PH0004983/512 - FIRST DEVON & CORNWALL LTD, THE RIDE, CHELSON MEADOW, PLYMOUTH, PL9 7JT Variation Accepted by SN: Operating between Newquay Manor Road and Newquay Manor Road given service number 58 effective from 24-May-2015. To amend Timetable. 558 (Newquay Local Service) Service to be re-numbered as service 58 .There are no changes to the actual timetable or route. PH0004983/519 - FIRST DEVON & CORNWALL LTD, THE RIDE, CHELSON MEADOW, PLYMOUTH, PL9 7JT Variation Accepted by SN: Operating between Newquay, Manor Road and Newquay, Manor Road given service number 59 effective from 24-May-2015. To amend Route and Timetable. PH0004983/466 - FIRST DEVON & CORNWALL LTD, THE RIDE, CHELSON MEADOW, PLYMOUTH, PL9 7JT Variation Accepted by SN: Operating between Falmouth Moor and Mylor Bridge/Penryn ASDA/Golden Bank given service number 68/66/69/69A/69B effective from 24-May-2015. To amend Route and Timetable. Timetable 68 Falmouth Moor - Golden Bank - Longfield - Falmouth Moor No change. PH0000135/164 - PLYMOUTH CITYBUS LTD, MILEHOUSE, MILEHOUSE ROAD, PLYMOUTH, PL3 4AA Variation Accepted by SN: Operating between Plymouth, Royal Parade and West Looe given service number 72 effective from 31-May-2015. To amend Route and Timetable. PH0000135/163 - PLYMOUTH CITYBUS LTD, MILEHOUSE, MILEHOUSE ROAD, PLYMOUTH, PL3 4AA Variation Accepted by SN: Operating between Liskeard, Barras Street and Polperro, Crumplehorn given service number 73 effective from 31-May-2015. To amend Timetable. Cant see anything on Citybus site but the only change I see is one journey leaves 5 mins later on schooldays. 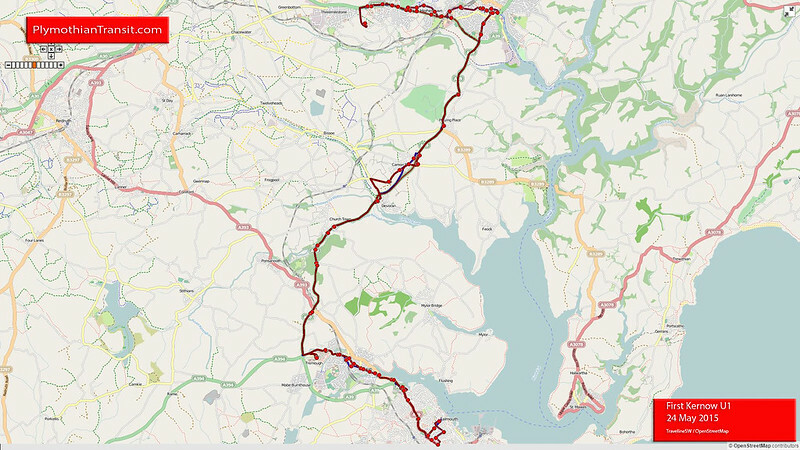 PH0000135/171 - PLYMOUTH CITYBUS LTD, MILEHOUSE, MILEHOUSE ROAD, PLYMOUTH, PL3 4AA Variation Accepted by SN: Operating between Liskeard, Barras Street and Padstow, Station Road given service number 75 effective from 31-May-2015. To amend Timetable. PH0004983/513 - FIRST DEVON & CORNWALL LTD, THE RIDE, CHELSON MEADOW, PLYMOUTH, PL9 7JT Variation Accepted by SN: Operating between Newquay and Truro given service number 85/84effective from 24-May-2015. To amend Route and Timetable. 585 (Newquay - Truro) Service to be re-numbered 85 There are a number of changes to the timetable, on some sections of the route (in view of the expected summer traffic congestion). PH0004983/522 - FIRST DEVON & CORNWALL LTD, THE RIDE, CHELSON MEADOW, PLYMOUTH, PL9 7JT Registration Accepted by SN Starting Point: Truro Bus Station Finish Point: Newquay Bus Station Via: Perranporth, Goonhavern Service Number: 86 Service Type: Normal Stopping Effective Date: 24-MAY-2015 Other Details: Monday to Saturday, hourly. PH0004983/501 - FIRST DEVON & CORNWALL LTD, THE RIDE, CHELSON MEADOW, PLYMOUTH, PL9 7JT Variation Accepted by SN: Operating between Newquay Manor Road and Truro Bus Station given service number 87/57 effective from 24-May-2015. To amend Route and Timetable. PH0004983/498 - FIRST DEVON & CORNWALL LTD, THE RIDE, CHELSON MEADOW, PLYMOUTH, PL9 7JT Variation Accepted by SN: Operating between Truro Bus Station and Newquay, Bus Station given service number 90/91/92/94 effective from 24-May-2015. To amend Timetable. The Monday to Friday (except Public Holidays) and Saturday timetables are identical to the revised timetables introduced from Sunday 12 April 2015. 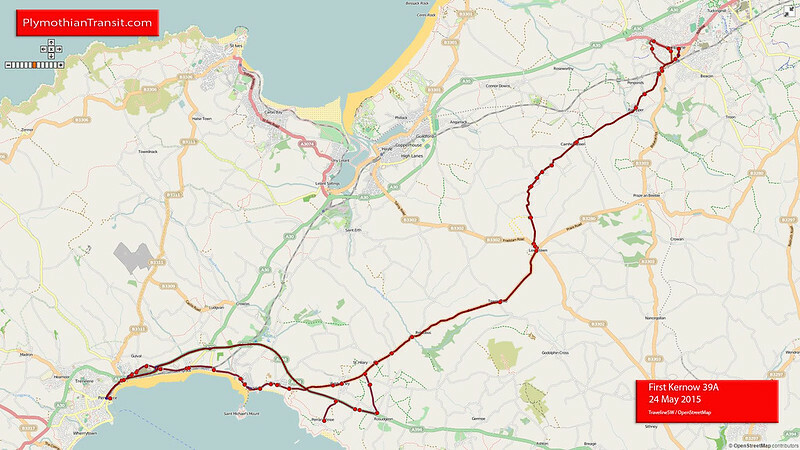 The Sunday and Public Holiday timetable is revised to facilitate the introduction of an hourly frequency for the summer period, with service 93 operating every hour, during the day time, between Newquay and Truro via St Columb Major and Indian Queens. There is no change to the routing of these services. Please see the timetable for full details (when available). PH1020951/179 - STAGECOACH DEVON LTD T/A Stagecoach South West, BELGRAVE ROAD, EXETER, EX1 2LB Variation Accepted: Operating between Stratton and Poughill given service number 128 effective from 30-May-2015. To amend Timetable. PH1020951/200 - STAGECOACH DEVON LTD T/A Stagecoach South West, BELGRAVE ROAD, EXETER, EX1 2LB Variation Accepted: Operating between Hartland or Crimp and Bude given service number 219/216/217 effective from 30-May-2015. To amend Timetable. PH0004983/472 - FIRST DEVON & CORNWALL LTD, THE RIDE, CHELSON MEADOW, PLYMOUTH, PL9 7JT ariation Accepted by SN: Operating between Lands End and St Ives given service number 300 effective from 24-May-2015. To amend Timetable. Three journeys in each direction will operate daily providing connectivity at Lands End with service 1A (Lands End - Penzance) and at St Ives with service 17B (Penzance " St Ives). Where possible (weather allowing!) service 300 will operate with an open top bus. PH1011427/75 - SUMMERCOURT TRAVEL LTD T/A TRAVEL CORNWALL, THE OLD COACH GARAGE, ST. AUSTELL STREET, SUMMERCOURT, NEWQUAY, TR8 5DR Cancellation Accepted by SN: Operating between St Austell, Trinity Street and Nanpean, Grenville Arms given service number 422 effective from 25-May-2015. PH1011427/69 - SUMMERCOURT TRAVEL LTD T/A TRAVEL CORNWALL, THE OLD COACH GARAGE, ST. AUSTELL STREET, SUMMERCOURT, NEWQUAY, TR8 5DR Variation Accepted by SN: Operating between Launceston and Trewint given service number 425 effective from 25-May-2015. To amend Timetable. PH1011427/72 - SUMMERCOURT TRAVEL LTD T/A TRAVEL CORNWALL, THE OLD COACH GARAGE, ST. AUSTELL STREET, SUMMERCOURT, NEWQUAY, TR8 5DR Variation Accepted by SN: Operating between SUMMERCOURT BUS GARAGE and ST AUSTELL TRINITY STREET given service number 432 effective from 25-May-2015. To amend Route and Timetable. PH1011427/76 - SUMMERCOURT TRAVEL LTD T/A TRAVEL CORNWALL, THE OLD COACH GARAGE, ST. AUSTELL STREET, SUMMERCOURT, NEWQUAY, TR8 5DR Cancellation Accepted by SN: Operating between Veryan School and Summercourt Bus Garage given service number 450 effective from 25-May-2015. PH1011427/57 - SUMMERCOURT TRAVEL LTD T/A TRAVEL CORNWALL, THE OLD COACH GARAGE, ST. AUSTELL STREET, SUMMERCOURT, NEWQUAY, TR8 5DR Variation Accepted by SN: Operating between Pedna Carne and Truro given service number 496/497 effective from 25-May-2015. To amend Timetable. PH1020951/224 - STAGECOACH DEVON LTD T/A Stagecoach South West, BELGRAVE ROAD, EXETER, EX1 2LB Variation Accepted by SN: Operating between Wadebridge and Camelford given service number 584 effective from 24-May-2015. To amend Timetable. Timetables not updated on Traveline as at 24th May! PH1020951/225 - STAGECOACH DEVON LTD T/A Stagecoach South West, BELGRAVE ROAD, EXETER, EX1 2LB Variation Accepted by SN: Operating between Wadebridge and Camelford given service number 595 effective from 24-May-2015. To amend Timetable. PH1020951/226 - STAGECOACH DEVON LTD T/A Stagecoach South West, BELGRAVE ROAD, EXETER, EX1 2LB Variation Accepted by SN: Operating between Camelford and Bude given service number 595 effective from 24-May-2015. To amend Timetable. PH0004983/452 - FIRST DEVON & CORNWALL LTD, THE RIDE, CHELSON MEADOW, PLYMOUTH, PL9 7JT Variation Accepted: Operating between Wadebridge and Royal Cornwall Show Ground given service number 855 effective from 04-Jun-2015. To amend Timetable. 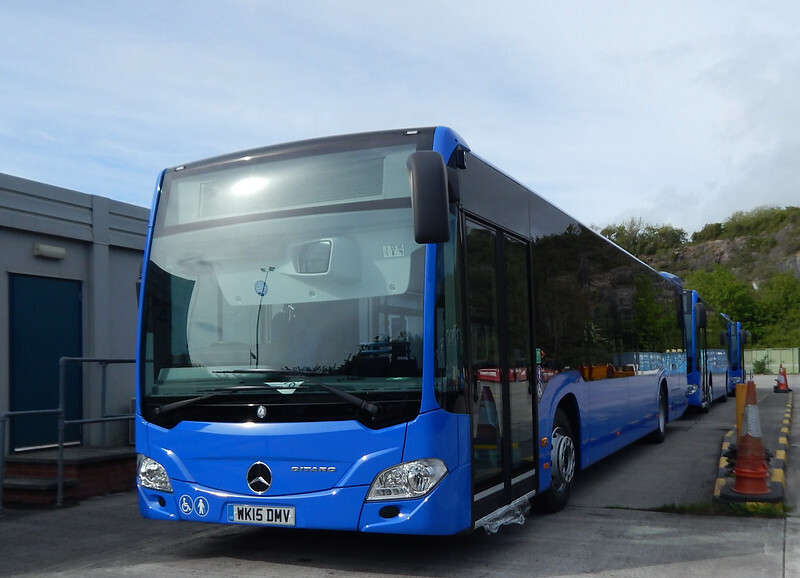 The new Mercedes Citaro buses for the Truro Park & Ride have been delivered: WK15DME/F/O/S/U/V/X. The former Park & Ride Scanias are now being repainted with 65762 now in the standard First Group livery. If this is to stay in Cornwall it looks like the much fabled new livery for Cornwall is not going to happen. It sounds like there will be quite an influx of newer low floor buses later in the year and these will all be in standard First livery with KERNOW names. Phew! Hopefully things will quieten down a bit now…. There is a mistake in the registration listing of the new Truro P+R Citaro's. Delete WK15DMS, correct registration is WK15DLZ. The new buses for Truro Park & Ride are owned by Cornwall County Council. Whoever won the contract would have got them. First haven't bought them. To be fair to first kernow have you seen how old some of there deckers are they still use k reg deckers in daily service that's older than me!!! I think this remark is a little unfair.. Yes Firsts fleet are a little old, but look at the fares in comparison with Citybus. 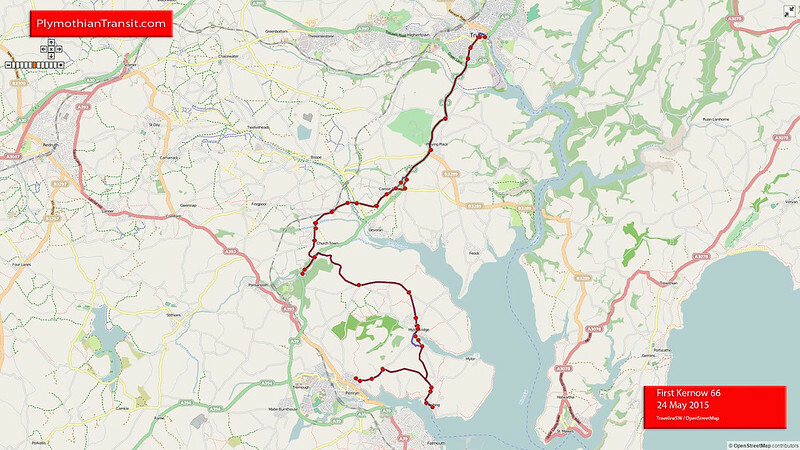 In the last 18 months or so since Alex Carter has been in charge, First seem to have successfully held on to their market in Tavistock and Torpoint despite Citybus competition and seem now to be holding their own in Mountbatten and Plymstock despite the best effort and full might of Citybus trying to push them out. They have also introuced 2 routes deep into traditional Citybus territory and a sign things are going good is that both these routes have been xtended to a 7 day operation, far cry from the cutting culture of the old First. That added in with much cheaper fares in compison to what they were charging and compared to the competitors shows they are going in the right drection in Plymouth. They have also seen off all competition in Cornwall and severley dented Webberbus in Somerset... not bad compared to the state First were in not so long ago I think! A fair bit there to chew on and I'm not as positive as you. In terms of the entire business, there's been some leaps forward. The demise of WG (and the previous tender exercise) has undoubtedly made FK more robust. BoS is more mixed and whilst it's in better shape, I'm not so certain that Webberbus are so dented. The fact that WB HAVE continued with the Wells area incursions and increased around Bridgwater shows its not all flowers. Similarly, there were the fairly substantial service cuts recently though the EDF and p&r work is a definite boon. In Plymouth, think this site highlights the disparate opinions. Some say First are doing well, some say not. Some say PCB have nearly half the Tavi trade yet some say much less so. Pays your money for the opinion you fancy! In terms of fleet, it's charitable to say that's First's fleet is a little old. In general, it's fairly elderly with an average age of probably c.14 years old in Plymouth. In Somerset, it's a tacit admission in that repainted fleet except the e200s has been registered with dateless plates; good as they are, the B10s they got were mainly X/Y reg so 2000/1 with Tridents even older. FK has some modern e400s but also is the home to many of First's remaining Olympians (albeit many aren't on full day workings). That said, improvements are planned and I'm sure that in a year's time, things will be much different again. So, in summary, not as positive as you but not as critical as our gramatically challenged First bashing recidivist! Thanks for posting this handy summary Graham - it looks like you've spent a lot of time putting the post together. Sad to see an ill informed rant about First from the persistent poster. The 'new' 15 reg buses are not First's, they're Cornwall Council vehicles purchased specially for the Truro Park & Ride contract which First operates for the council. There is nothing wrong with operating older vehicles - and First comply to the same basic engineering requirements that all operators have to. Buses are given an MOT type inspection every 4 weeks at the most, and if there was any serious defect then the bus wouldn't be allowed on the road. First D&C haven't been called to a maintenance related PI for a number of years now, which suggests their fleet is up to the accepted standards DVSA require. A bus needing some paint isn't a 'serious' mechanical defect, surprisingly. It is questionable whether it is worth painting a bus that has two years of useful operational life ahead of it- step entrance double deckers cannot be used on local bus services post 2017, and it is highly likely that the vehicles just transferred in are going to replaced before that time comes anyway. Stagecoach paint their fleet once every three to four years. Other companies have longer intervals between repaints. My local Go Ahead subsidiary works to a 5/6/7 year interval, but they frequently transfer buses between 'brands' (or depots as most think of them) thus necessitating a full repaint. Don't forget that the collapse of Western Greyhound has created a major need for ANY serviceable spare vehicles available within First and all operating companies have been asked to send spare buses down to maintain the services in the shorter term. It is highly likely that Plymouth is busy preparing those vehicles for service just as they are busy painting the BoS fleet into green. A lot of younger kit is going into First D&C now and one presumes Plymouth will get some of this in due course. A number of single decks require replacement before the year is out, if they aren't converted to DDA like PCB has with their older Dart SLFs. First D&C are pitching their fleet offering for Plymouth down the older route, which means the margins required are lower than PCB who have adopted a totally different fleet strategy going for regular intakes of brand new stock. The Truro ones are supplied and owned/leased by Cornwall Council; First just operate them. Plymouth City Council could do the same with their Park and Ride operations but have elected to allow First to operate them commercially. You get what you pay for....PCC don't pay for anything! And you know what.....I think you know all that too.